A few movie reviews from the past 10 days. A post-Christmas tradition for me when I spend a few holiday days in Sarasota is to go to a couple of movies. If the weather looks dull, I jump on the Longboat Key trolley into town to catch a matinée. Here are some of the films I have seen this week. Generally I like this kind of film with convoluted plot lines and the peeling off information like layers on an onion. When I got to the end, however, I left the theatre feeling generally uneasy. I was not sure why. I think that by the end of the movie, I was feeling like I had spent two hours with characters, none of whom, I liked. I liked the acting. I didn’t like the characters. Maybe this is a credit to the movie that they could get under my skin so much. I had the initial plot twists figured out almost from the word go. So I enjoyed the second half of the movie more, not being sure where it was all heading. I looked online when I got home to find that there has been quite a bit of discussion about the ending of the book (and movie). It seems that I was not alone in finding it unsatisfying. It is difficult for me to say much more without a lot of spoilers. So I will let you see for yourself. 3 1/2 Stars out of 5 from me. I will start by saying that I am generally not a Sondheim fan. I find his music lacks tunefulness. 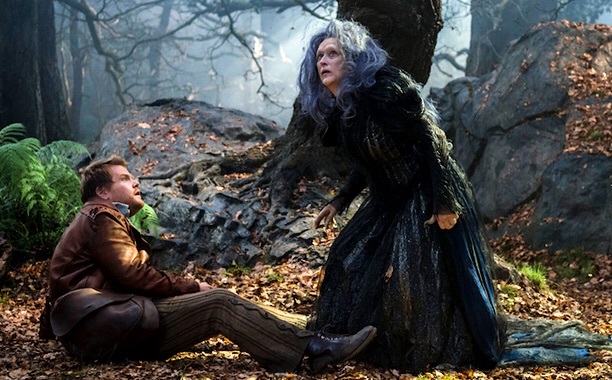 And Into the Woods is particularly lyric heavy with the music fitting the lyrics rather than the other way around. I have also said before that there are very few stage musicals that adapt well to film. This one is an exception. The fantasy and story-line(s) of Into the Woods worked better for me as a movie than when I have seen it performed live. In a movie you can make a real Giant, a beanstalk and a witch that disappears in a whirlwind of dust. This visual stuff was lots of fun. I liked Meryl Streep when she was witchy, Johnny Depp when he was Wolfish and the two princes made me laugh out loud when they were singing “Agony” while splashing around in a waterfall. The kids in the movie were fantastic and I liked it that the actors were not all people I knew. In Les Mis I was put off by the fact that I was very much aware that I was watching Hugh Jackman and Sasha Barron Cohen and Russell Crowe. I came away thinking that there must be a life message here somewhere but the problem is that there are hundreds. Lots of overlapping themes – parent and child, good and evil, old and young, rich and poor, right and wrong, lost and found – you named it, it’s there. Then again, isn’t that like life itself. We are wandering in the woods and never sure what is coming next or where it will take us. Life just isn’t a straightforward story. This movie may become the 21st century equivalent of Wizard of Oz. It must have been tempting for director Rob Marshall to shoot this film in 3D but I am glad he did not. No need to overwhelm us. If you like the stage play you will probably like the movie. If you can’t let your fanciful self go into the muddle in the woods or you don’t like people singing their dialogue you may find this one over the top. I liked it and give it 3.5 stars of 5. Stephen Hawking is certainly an unusual phenomenon and this movie outlines the earlier part of his life extremely well. Sometimes it is a struggle to watch but then you think what a struggle that life must be to live, both for him and his family. Incredible, really. I am sure there were many moments in the lives of Hawking and his family that would not make for good cinema so we are just witnessing the tastier bits. Eddie Redmayne is consistently in character and gives a realistic portrayal of the disabled Hawking. His contorted facial expressions are all that he has left near the end to tell us what he is thinking and feeling and he does this extremely well. Oscar bait here. Felicity Jones (who is she, anyway?) also gives a strong, moving and credible performance as Hawking’s wife, Jane. Cambridge as a backdrop is elegantly perfect. Warning: you will shed tears. 4 stars of 5. I picked this one to see as I thought it would be different. It was. It is a mash up of Mork and Mindy/ET/Fred and Ginger meet Austin Powers done up Bollywood style, set in Bruges, Belgium and Delhi, India and all in Hindi with sub-titles. It is a 2 1/2 hour story about a big-eyed, big-eared alien from another planet trying to get home and two star-crossed lovers who need his help to find themselves again – with social commentary about religion and a few song and dance spectacle numbers thrown in. The film is awash in pastel colours, almost cartoonish at times but very pleasing to watch. And I must admit that I like the Bollywood production numbers, if just for their vitality. Although it has broken the record for Bollywood films internationally I was alone with two women who did not need sub-titles in the theatre watching it the afternoon I went. I have no idea how many stars to assign to this movie. I have nothing to compare it with. I did find it entertaining. And it was drizzling rain on the beach so this was a bright alternative. This entry was posted in Uncategorized and tagged Gone girl, Into the woods, Movies, PK, Reviews, Theory of everything. by johnageddes. Bookmark the permalink.